The gun case accommodates a single Glock 19 handgun along with storage for up to three magazines. Usually ships in 5 to 7 business days. The gun case accommodates a single Glock 17 handgun along with storage for up to three magazines. Usually ships in 5 to 7 business days. This pistol case accommodates a single M9 handgun and stores for up to three magazines. Usually ships in 5 to 7 business days. Custom foam interior will accommodate one Sig Sauer P228 handgun and 3 magazines. Pad-lockable. We ship these cases to APOs. Please check with customer service for the correct shipping charges. Usually ships in 5 to 7 business days. Case with custom foam interior will accommodate a single Smith & Wesson SW1911 handgun with storage for 3 magazines. Usually ships in 5 to 7 business days. Custom foam interior will accommodate one M9 handgun and 3 magazines. Pad-lockable. We ship these cases to APOs. Please check with customer service for the correct shipping charges. Usually ships in 5 to 7 business days. KR4809-05 Shotgun case The universal handgun case accommodates a single handgun, six magazines, and accessories. This universal handgun case accommodates two handguns and six magazines. Custom foam interior will accommodate two M9 handguns and 6 magazines. Pad-lockable. We ship these cases to APOs. Please check with customer service for the correct shipping charge. Usually ships in 5 to 7 business days. 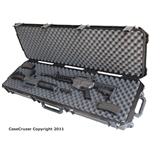 Universal gun case with interlocking convoluted foam � 36" in length. Usually ships in 2 to 3 business days. GunCruzer gun case holds guns up to 35" long. Case comes with convoluted interlocking foam. Outside dimensions 38.12"L x 16"W x 6.12"H. Usually ships in 5 to 7 business days. GunCruzer Universal 5-Pack Gun Case - Gun cavity dimensions are 9.23L x 4.75H - GunCruzer case protects Beretta - Colt - Glock - SIG-Sauer - S&W and other favorite firearms from travel bumps and bruises. Great for Collectors - Sportsmen and Law Enforcers. Usually ships in 5 to 10 business days. Universal gun case with interlocking convoluted foam - 41" in length. Usually ships in 2 to 3 business days. GunCruzer gun case can hold guns up to 41" long. Includes convoluted interlocking foam. Outside dimensions 44.37"L x 16"W x 6.12"H. Usually ships in 5 to 7 business days. (Strictly for Law Enforcement or Military use). Usually ships in 5 to 7 business days. 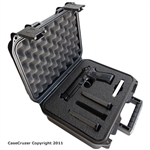 GunCruzer gun case can hold guns up to 50" in length. Convoluted interlocking foam layers fill base and lid. Outside dimensions 53"L x 16"W x 6.12"H. Usually ships in 5 to 7 business days. Universal gun case with interlocking convoluted foam - 50" in length. Usually ships in 5 to 7 business days. (Strictly for Law Enforcement or Military use). Usually ships in 5 to 7 business days. GunCruzer Universal 6-Pack Gun Case - Gun cavity dimensions are 9.23L x 4.75H - GunCruzer case protects Beretta - Colt - Glock - SIG Sauer - S&W and other favorite firearms from travel bumps and bruises. Great for Collectors - Sportsmen and Law Enforcers. Usually ships in 5 to 10 business days. Universal shooting range handgun case holds 4 handguns and 8 magazines. Case also features space for accessories. No Wheels. Case holds most semi-automatic pistols that are longer than 7" in overall length. Major brands which fit in this case include: Beretta, FNS, FNH, H&K, Sig Sauer, Remington, Glock, Ruger, Springfield, Auto-Ordnance, Smith & Wesson Steyr, Colt, and Walther. Does not include desiccant. Handgun case holds 3 handguns, magazines, and room for accessories. No Wheels. Case holds most semi-automatic pistols that are longer than 7" in overall length. Major brands which fit in this case include: Beretta, FNS, FNH, H&K, Sig Sauer, Remington, Glock, Ruger, Springfield, Auto-Ordnance, Smith & Wesson Steyr, Colt, and Walther. Does not include desiccant. 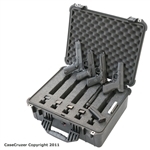 Universal handgun case holds 6 handguns and 12 magazines. No Wheels. Case holds most semi-automatic pistols that are longer than 7" in overall length. Major brands which fit in this case include: Beretta, FNS, FNH, H&K, Sig Sauer, Remington, Glock, Ruger, Springfield, Auto-Ordnance, Smith & Wesson Steyr, Colt, and Walther. Does not include desiccant. 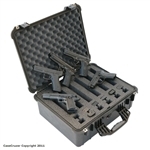 Universal shooting range handgun case holds 5 handguns and 10 magazines. Handgun case also has room for accessories. No Wheels. Case holds most semi-automatic pistols that are longer than 7" in overall length. Major brands which fit in this case include: Beretta, FNS, FNH, H&K, Sig Sauer, Remington, Glock, Ruger, Springfield, Auto-Ordnance, Smith & Wesson Steyr, Colt, and Walther. Does not include desiccant. M4 & M16 Rifle Universal Gun Case - CaseCruzer. Usually ships in 5 to 7 business days. Case comes with folding handle and wheels. Custom foam interior secures one AR10 rifle along with your favorite handgun. Holds a total of (7) rifle mags. and (3) handgun mags. Allows operators to configure the foam to their individual preference. Air and watertight with PRV valve. Made in USA. Lifetime Guarantee. Color: Black. Usually ships in 5 to 7 business days. Case comes with folding handle and wheels. Custom foam interior secures all models of AR, M4, SOPMOD or M16 along with your favorite handgun. Holds a total of (7) rifle mags. and (3) handgun mags. Allows operators to configure the foam to their individual preference. Air and watertight with PRV valve. Made in USA. Lifetime Guarantee. Color: Black. Usually ships in 5 to 7 business days. Universal custom handgun case comes with a tan plastic interior. Holds 4 handguns and 8 magazines. Case also features space for accessories. No Wheels. Case holds most semi-automatic pistols that are longer than 7" in overall length. Does not include desiccant.